Greensboro-based Guerrilla RF has recently been awarded ISO 9001:2015 certification. ISO, the International Organization for Standardization, develops standards that set specifications for products, services and systems, to ensure high levels of quality, safety and efficiency. Guerrilla RF is a major supplier of high performance Radio Frequency Integrated Circuits (RFICs) and Monolithic Microwave Integrated Circuits (MMICs) for consumer, commercial and military wireless product applications. The company’s patented Guerrilla Armor™ technology enables greater coverage area and higher data rates for wireless networks. As part of its ISO certification process, Guerrilla RF underwent a rigorous audit of its business and management processes, including the design, operations and sales processes. 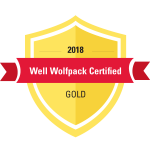 The company engaged NC State University Industry Expansion Solutions for an ISO 9001:2015 overview to increase its chances of a successful audit. After completing an initial overview session for the entire organization, the IES Improvement Specialist returned for a three-day internal audit training class. When the company completed its certification audit with TUV Rheinland of North America in September, the company was found to have zero non-conformances, an optimal outcome. In an increasingly competitive manufacturing environment, ISO certification can be a deciding factor in winning or keeping business.